As the rollercoaster ride of his career nears its end, Stephon Marbury is determined to bow out a true legend in the place he now calls home - Beijing. A bona-fide hero in the city after helping the Beijing Ducks win three CBA titles between 2012 and 2015, Marbury's deep connection with the capital has cemented his iconic status in China and forever endeared him to fans here, even after his six-year marriage with the Ducks ended in somewhat acrimonious fashion in April. To the delight of his fans, a new one-year contract with the Beikong Fly Dragons, Beijing's other CBA franchise, has allowed the veteran to continue his love affair with the city and Chinese basketball. "I am thankful to the Beikong organization for giving me a chance to compete as a 40-year-old veteran in the city that I love," Marbury said at his official unveiling at the Olympic Sports Center Stadium, the Fly Dragons' home arena, on Sunday. "I will fight with everything in me to lead the team through its forthcoming challenges and help each player improve and grow." 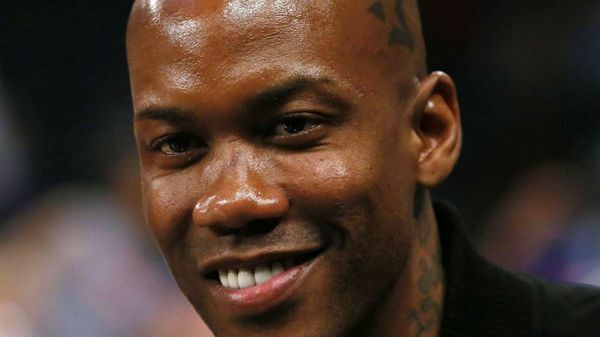 Marbury revealed that he will retire from professional basketball after playing in Beikong's yellow jersey for one more year with a reported salary of $1.3 million. The former NBA All-Star wanted one more season with the Ducks, whom he led to their maiden CBA title in 2012, after missing out on the playoffs last term. However, keen to initiate a rebuilding process, the club only offered Marbury a role as an assistant coach, which he declined. The two parties split, leaving Beijing's basketball community lamenting the loss of a true fan favorite, who has a bronze statue erected in his honor outside Wukesong Arena and boasts his own personal museum near Tian'anmen Square. Despite the bitter separation from the Ducks, Marbury said he never fell out of love with his adopted home. "My spirit really didn't agree with going anywhere else other than playing basketball here," said Marbury, who stars as himself in My Other Home, a biographical movie which premiered on Sunday and tells the story of his redemption from a declining NBA player to a champion in China. "I felt like going to another team my legacy wouldn't have stayed the way it's capable of staying, so my decision to stay at home was an easy one that worked out with Beikong." The Fly Dragons, owned by State-controlled Beijing Enterprises Group, is entering its fourth season in the CBA after being promoted from the second-tier National Basketball League in 2014. The team has signed an experienced front-court combo in American Shavlik Randolph and Jordanian Zaid Abbas to assist Marbury as it aims to reach the playoffs for the first time in its history. The Fly Dragons have also hired Ding Wei, former assistant coach of reigning CBA champion the Xinjiang Flying Tigers, to help gel the three foreign veterans with a relatively immature local roster. Ding reckons Marbury's experience and fighting spirit will be invaluable. "I think the biggest difference he will make is to change the team's mental toughness by bringing a strong desire for victory. That's how I expect him to influence our young guys, making them more aggressive and hungry so they can survive in an increasingly competitive league," said Ding. Although qualifying for the postseason looks a big ask, Marbury has set his sights on a higher goal. "The only way you actually work toward the championship is you starting thinking about it," said the former New York Knicks and Boston Celtics player, who first joined the CBA with Shanxi in 2010. "If we train like champions and we think like champions, we have an opportunity to be champions. This may be a far-fetched goal but this is how I prepare for the season."